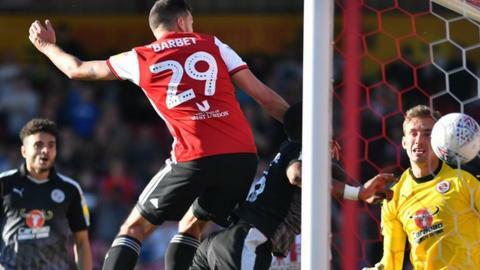 Yoann Barbet headed a stoppage-time equaliser to rescue a point for 10-man Brentford against Reading. The Royals came from behind after two mistakes from goalkeeper Daniel Bentley allowed Jon Dadi Bodvarsson to level before the break and John Swift's free-kick to drop over the line in the second half. Said Benrahma was then sent off in the closing stages for two bookable offences, but full-back Barbet nodded in at the back post to secure a point in stoppage time. Championship top scorer Neal Maupay had earlier opened the scoring for the hosts after slotting the ball past Sam Walker from six yards out. Maupay rolled in his ninth goal of the season after Benrahma found the striker unmarked in the penalty box. But two spillages either side of half-time from Bees shot-stopper Bentley allowed Paul Clement's side to take the lead. A 25-yard shot from Swift was bundled over by Bodvarsson before the midfielder got on the scoresheet after Bentley fumbled his free-kick over the line. Benrahma was handed a second yellow card without hesitation from referee Geoff Eltringham before nine minutes of stoppage time. But despite being down to 10 men, Dean Smith's side flooded forward and Barbet headed in the equaliser from a corner. "I don't think I've ever been involved in a game like that where 10 minutes have been added on and an air ambulance hasn't arrived. "They came and slowed the game down and were allowed to do it by the referee, who booked no-one in the first half and then threw cards around like confetti in the second. "I'm still trying to sort my head out after that game. It will be interesting watching it back but in the end, I have to praise my side's character in fighting to the end and then going looking for the winner. That's the way we play. "Daniel will be disappointed with the two mistakes but he has saved us plenty of times before." "(It was a) great game, loads of passion, edge of your seat stuff. "We are disappointed to not have taken all three points particularly because they had 10 men on the field. "There has been a mental shift in this team and that's pleasing. I think we have turned a corner but we know we have to keep it going. "The fans here today were unbelievable for us, absolutely fantastic." Match ends, Brentford 2, Reading 2. Second Half ends, Brentford 2, Reading 2. Attempt blocked. Sergi Canos (Brentford) header from the centre of the box is blocked. Assisted by Alan Judge with a cross. Offside, Reading. Andy Yiadom tries a through ball, but Jón Dadi Bödvarsson is caught offside. Hand ball by Liam Kelly (Reading). Corner, Brentford. Conceded by Tiago Ilori. Goal! Brentford 2, Reading 2. Yoann Barbet (Brentford) header from very close range to the high centre of the goal. Assisted by Chris Mepham following a corner. Attempt blocked. Sergi Canos (Brentford) right footed shot from outside the box is blocked. Assisted by Lewis MacLeod with a headed pass. Substitution, Reading. Liam Kelly replaces John Swift because of an injury. Second yellow card to Said Benrahma (Brentford) for a bad foul. Corner, Brentford. Conceded by Andy Yiadom. Substitution, Reading. Sone Aluko replaces Yakou Meite because of an injury. Attempt missed. Sergi Canos (Brentford) right footed shot from outside the box misses to the right. Assisted by Neal Maupay. Attempt missed. Neal Maupay (Brentford) right footed shot from outside the box is close, but misses to the left. Assisted by Kamohelo Mokotjo.